In the midst of all this mathesis stuff, I hope you, dear reader, haven’t forgotten that I have other things to chew on my metaphysical plate. The past few months have been busy with developing the Tetractys of Life and mathetic rituals, but I’ve also been tackling other projects and problems as they’ve been coming up. As I’ve started working with Saint Cyprian of Antioch this year, that amazing patron saint of magicians and all those who “work with both hands”, I’ve been making weekly offerings to him as well as other ex voto offerings as we exchange work for Work. This time of year, the end of summer and start of fall, is important to the good saint; the Feast of Saint Cyprian of Antioch is coming up on September 26, which falls on a Friday this year. The date is also important, as it’s the yearly festival of Venus Genetrix for the Romans, and since the lady is also important to me, it’s a day I really have to prepare for. I’m planning a party for myself and many of my friends in honor of Saint Cyprian, which is nice since it’s on a Friday, but I have plenty of preparation to do in the meanwhile. For one, today marks day one of the Days of the Cyprians. As it turns out, there are two Saints Cyprian: one from Antioch whom we all know and love, and one from Carthage. 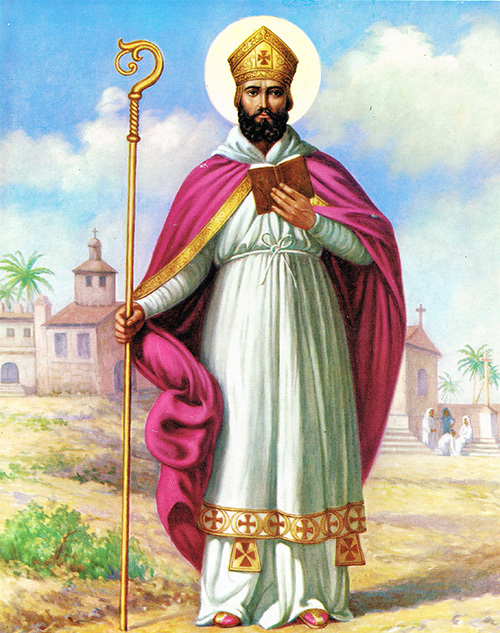 Saint Cyprian of Carthage is another Saint and Martyr of the Catholic Church (one who is officially recognized, no less) who lived in the third century AD, the Bishop of Carthage for about ten years, and eventually was persecuted and martyred under Emperor Valerian I. He was famous in his day for being a classically trained orator from a rich family who turned to Christianity and became an important theologer and writer in early Christianity. In fact, before Augustine and Jerome, Cyprian of Carthage was known as the Christian writer, and we can attribute the phrase “there is no salvation outside the Church” to him. Of course, he’s not very commonly known nowadays and is only kinda dimly remembered by most of the Catholic Church, and I can’t really find anything he’s patron outside of being the patron saint of North Africa. However, although the two saints are often conflated with each other, Saint Cyprian of Carthage is sufficiently different to have a different prayer medallion from Saint Cyprian of Antioch, as can be seen below. Saint Cyprian of Antioch has his crosier and book, while Saint Cyprian of Carthage has his crucifix and (what looks like) palm fronds. Saint Cyprian of Antioch’s feast day is September 26. The feast day of Saint Cyprian of Carthage, however, is September 16 (yesterday). These two feast days are spaced nine days apart, and nine is a number sacred to Saint Cyprian of Antioch. These nine days are sometimes called the Days of the Cyprians, starting today. Some devotees and followers of Saint Cyprian of Antioch use these days for special devotions, charitable actions, and powerful works in honor of Saint Cyprian of Antioch, and I plan on doing the same starting tonight. My household and I are doing novenas to Saint Cyprian of Antioch, seeing how we all work with occult powers in distinct ways that often focus on the dead and on our ancestors, as well as to ask for his blessings in the coming year. And given the excitement and development we’ve all been through this year, we could probably use his help more in the coming year! Besides, the closer I work with Saint Cyprian, the more things I can do are revealed to me, especially with me falling fairly solidly under his patronage. I also want to use this period to do something special for Saint Cyprian of Antioch, too. Many saints have their preferred offerings, this type of flower or that type of drink, but in general saints love acts of charity: giving to the poor, helping the disenfranchised, and generally doing good works for others. With that in mind, I had an idea for a bit of a contribution of sorts, and I need your help with this. Long story short, pitch in some cash for me to donate to people who are badly off, and you’ll get entered into a raffle for something in return. I hope you consider pitching in, since this is a way we can all help out and earn the blessings of the good saint together. Donate money, no less than US$3.00, to my PayPal account using the button below (not the one on the sidebar unless you just want to give me money without getting anything in return). I suggest $9 or amounts in multiples of 9 (27, 81, 90…), since this is a number sacred to Saint Cyprian of Antioch. Every person who donates money will have the Chaplet of Saint Cyprian prayed in their name and have petitions made to Saint Cyprian on their behalf when I make devotions to him that night. Every person who donates will be eligible for one of nine prizes (see below), with the winners chosen randomly by noon US Eastern time on Friday, September 26. When going through PayPal, please be sure to write “Saint Cyprian of Antioch, pray for us” in the instructions, along with your mailing address, any special petitions to be made to Saint Cyprian of Antioch, and whether you wish to remain anonymous in the final fundraiser thank-you. If you’re unable to provide instructions through PayPal, please send me an email from the same address you sent money through PayPal. If you do not do this, you will not be considered for this contest. You can donate however many times you want or however much you want, but you’ll only be entered into the raffle once. These rules are valid starting with this post and ending at 9 p.m. US Eastern time on Thursday, September 25. Donations given after that point will not be considered for this contest. On Monday, September 29, I’ll send out all the prizes and start talking to people about scheduling their readings and consultations. I’ll go ahead and donate the entire sum of money accrued through PayPal to the charitable organization the Malala Fund which empowers girls through education and helps Pakistani, Kenyan, and Syrian children and refugees, and named after Malala Yousafzai, the Pakistani girl activist who was shot by Taliban extremists, survived to world acclaim, and has been working since to improve the condition of life for girls and children across the world in extreme conditions. I’ll be keeping none of the money for myself; it will all be donated in the name and honor of Saint Cyprian of Antioch, and I’ll post a giant thank-you to everyone who donated (if you want to remain anonymous, say so when you donate, but I will not report on how much individuals donated anyway). The more people who donate, the more money can be raised and given to charity, so help spread the word and get more people involved! I’ll be pitching in some seed fundraiser money, too, but I won’t be entering myself into the contest.